The year is 1983. Twice in the space of an hour, a jet-powered car streaks across the Black Rock Desert in Nevada, a plume of dust streaking behind it. The land-speed record (633.47 mph) set on that day by the Thrust2 and its driver, Scottish entrepreneur Richard Noble, stood for over a decade. Now, he’s back. 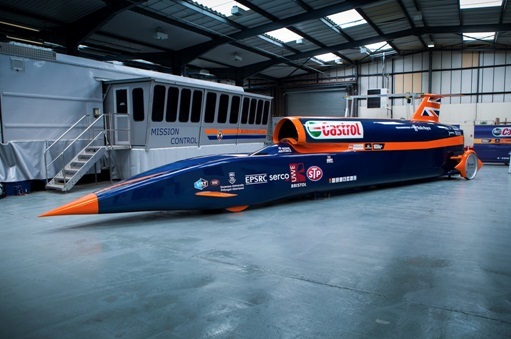 Though a little long in the tooth to be doing the driving himself, Noble is at the head of a team of 70, all of whom are focussed on perfecting the new, 69 million dollar Bloodhound SSC project. With that much power behind it, it’d be tempting just to find a flat patch of land and press the “go” button, but the testing process is, of course, much more rigorous. Starting in May of next year, the Bloodhound will slowly be taken through its paces, pushing the speed higher and higher with every excursion. Finally, in August 2015, Noble and his Bloodhound team will travel to the Hakskeen Pan, a dry lake-bed in the north of South Africa. There, the Bloodhound will have to burst well past the sound barrier not once, but twice, as what goes down in the record books is the average top speed of two runs performed within an hour of each other. If successful, the record will go to the Bloodhound team’s driver, Andy Green, who was the man who beat Noble’s record in 1997 (a project also headed by Noble). Essentially, if it’s had anything to do with breaking the land-speed record, you can be sure that Richard Noble has been involved, and though I don’t expect we’ll be seeing 1,000 mph cars on our highways anytime soon, the innovations required in designing the Bloodhound can always be reapplied in ways no one could have expected. When it comes to a jet-and-rocket-powered car, the benefits will probably be less universal than say, a NASA project, but who knows? Could the Bloodhound team inadvertently shape the future of how we perceive, operate, and buy cars?